It’d be a matter of time until we eventually get all the GX versions of those Eeveelutions. With guaranteed Pokémon merchandise such as Espeon/Umbreon-GX Box, Evolution Celebration Tins, and the most recent Special Collections, you should be able to get one of each Eeveelutions. It’s not often that we’re guaranteed to get the entire Eevee family, but the Sun & Moon series has made the dreams of collectors come true. Anyhow, Vaporeon-GX is what we’re looking at today, complete with an ability and two attacks. Hydrating Drops Ability lets you heal 30 damage from your Active Water Pokemon. 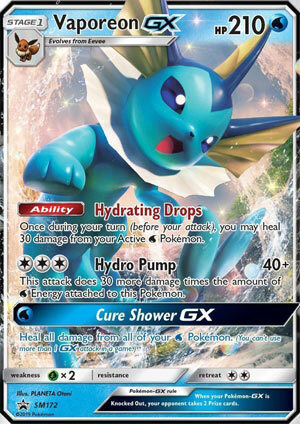 That could help tank some more hits, and with four Vaporeon-GX in play, you can heal 120 damage, which is pretty good coming from an Ability that could constantly work every turn as long as you keep them in play as opposed to one-off item cards. Still, even healing 120 damage may or may not be able to change what would’ve been a 2HKO into a 3HKO. Healing is not the same as reducing damage, so damage calculations will differ. The factors can take into account may involve how many Vaporeon GX in play and the use of BodyBuilding Dumbbells. Hydro Pump is another classic attack that costs CCC for 40 damage, plus 30 more for each W energy attached to this Pokémon. A minimum of WWW becomes 130 damage, and with Choice Band makes it 160, which can barely 2HKO the game. However, if you’re going to OHKO something with this attack, then it’ll take eight energies to do that on 300 HP Pokémon. I wouldn’t have load up too many energies with a serious chance of getting OHKOed back. Cure Shower costs W and heals all damage from your water Pokemon. If spread damage becomes problematic, then this GX attack can help you in a pinch, but otherwise it’s not worth using. Vaporeon-GX gives me the impression that it should be the focus of the deck, with other cards supplementing it. Standard doesn’t have much in terms of Eeveelutions, Water type support, and Stage 1 support, but Expanded has more to work with. Jolteon and Flareon from XY Ancient Origins can add additional types so that Vaporeon can become Water, Fire, and Lightning, which can help exploit more weaknesses. And with Energy Evolution Eevee and Eevee-GX, you have more opportunities to get those evolutions in play. All the added combo is stopped cold with ability denial or even EX/GX denial, so you have to find a way to bypass that. Overall, this is one fun toy to experiment with. Vaporeon GX (SM172) entered the Pokemon Trading Card Game recently as a black star promo card. This 210 HP Water type has an ability and two attacks. Its ability, Hydrating Drops, allows you to heal 30 damage from your active Pokemon once per turn. Obviously, if you can get three or even four Vaporeon GX’s out, you could possibly wipe out most – if not all – of the damage from an attack from Zoroark GX. 210 has become a fairly attainable number, and Grass weakness is the worst weakness to have right now (I’ve faced Grass types 39 times in 209 matches this month, almost once in every five matches, more than any other type), but if your opponent can’t do 210 or more, it could be a long day for them. I really like Hydro Pump, too. We’ve seen with Quagsire and Naganadel that you can potentially move a LOT of Water energy on to a single Pokemon. And if the Quaganadel combo doesn’t work, we have the new Blastoise coming out that looks like it will be a very good energy accelerator. I know seven energy sounds like a lot – that’s how much you would need to OHKO a Magikarp Wailord without a Brawny Pads – but it’s not an impossible number. Cure Shower is extremely unimpressive to me, especially since you’ve already got Hydrating Drops, but overall, I think this Vaporeon has some upside. The ability to hit well into the two hundreds is becoming extremely important, and if you can heal 90 or 120 damage each turn on top of that, well, that has the makings of a potentially top tier Pokemon. And I haven’t been too hot on GX Pokemon lately, so for me to think this highly of a GX Pokemon is saying something. Shameless plug: I put a list of commonly used Supporters, Items, Tools, Stadiums, and Special Energy here. I am starting to draw up some decklists so I’m ready to go on Friday the 1st, and I wanted to have a list of commonly used cards right now (including what I think will be the good ones from Team Up) so I won’t forget any staples / might get inspired by trying a card I might not have thought of otherwise. Vaporeon-GX (SM – Black Star Promos SM172) continues our (mostly) Eevee-themed week. Being a Pokémon-GX comes with the usual baggage (gives up an extra Prize when KO’d, vulnerable to stuff like Desert Ruins, etc.) and we’ll see if it comes with the usual perks (better stats/effects than a baseline Vaporeon). A small added bonus is you can run the baseline versions of Vaporeon alongside Vaporeon-GX, up to four of each; they’ll have to share the same Basic Stage, but the “-GX” means they count as having different names. Vaporeon-GX is a Stage 1, so it takes up more room and is a slower than a Basic, but is still fast and efficient enough to be easily competitive if the rest of the card doesn’t let us down. It can almost fake being a Basic as well if run with basic Water Energy cards and Eevee (Sun & Moon 101/149) or – in Expanded – Eevee (XY – Furious Fists 80/111), due to the “Energy Evolution” Ability each of these Eevee posses. Attach a basic Energy card to them, and you are allowed to search your deck for an Eeveelution of that Type then play it onto Eevee, evolving it. It even works on the very first turn of the game! Being part of the Eeveelution family MAY grant additional benefits; even in a deck that normally wouldn’t want something other than a Stage 1 [W] Type like Vaporeon-GX, this shared nature makes it easier to include the other Eeveelutions, whether just one or multiple. Getting back to the [W] Typing, Vaporeon-GX can more easily punish an opponent’s Blacephalon-GX or (in Expanded) Volcanion-EX. There are a few other [W] Weak Pokémon which see competitive play, but they’ll only matter if you’re running Vaporeon-GX without almost no [W] Energy. When on-Type, Vaporeon-GX enjoys some nice tricks, including Aqua Patch. The only specific anti-[W] effect you’re likely to encounter is in Expanded because one-side of Parallel City gives [W] Types (and [R] and [G]) -20 damage. 210 HP is good for a Stage 1 Pokémon-GX? Definitely not the highest, but up there; OHKOing Vaporeon-GX will usually require a deck dedicated to big hits or a solid [G] Type attacker, which brings us to Weakness. [G] Type attackers are indeed a thing, though usually in combination with something else. They aren’t a super-easy splash either. So it isn’t good, but it could be worse. Nothing is worse than no Resistance, but it is so common I left it out of my first draft; the increased HP may have made it a little more useful than normal, but moving on. The Retreat Cost of [CC] isn’t good but it isn’t especially bad, either; what makes it sting is that tend to naturally compensate for higher scores and are better able to utilize lower ones… so we tend to “feel” [CC] more. Vaporeon-GX sports an Ability, an attack, and a GX-attack. “Hydrating Drops” is the typical once-per-turn Ability you’ve got to use before you attack. It lets you heal 30 damage from your Active [W] Pokémon. Healing is an iffy thing in the Pokémon TCG; as with adding damage, it only matters if we’re triggering an effect or it buys a Pokémon at least one extra turn of life. 30 damage is the same a Potion, a card very few competitive decks use (or have used, given that Potion originally appeared in Base Set). Still, there are enough decks that only just score a 2HKO that it can be handy… and even though the wording makes it sound otherwise, you’re only limited to one use per instance of Hydrating Drops. In fact, if you could send a used instance to another zone (deck or discard pile) then get it back into play, the Ability resets and you could use it again. No, I’m not recommending such an elaborate play. With a full four Vaporeon-GX Benched, you could heal 120 total damage from your Active [W] Type… but I’m not recommending that elaborate a setup, either. Four Stage 1 cards eating up space in your deck and on your Bench to make a 2HKO all but impossible isn’t that good when there are least a few OHKO decks out there, and when that space could be used for more useful support. Hydrating Drops isn’t bad, but it isn’t especially good, either. It might be “adequate”; I don’t like that it is ONLY your Active and only if it is a [W] Type. Perhaps because Vaporeon-GX can make use of its Ability right away, it doesn’t have a nice, single Energy attack like the other Eeveelution-GX cards. The one attack available here is “Hydro Pump” for [CCC], doing 40 damage plus another 30 per [W] Energy attached to the attacking Vaporeon-GX. In a deck that can supply a good deal of [W] Energy that’s nice; for smaller targets just invest [WWW] and you’ll still one-shot them as that’s 130 damage! For a bigger HP scores, you’ll need five or six [W] Energy for the OHKO. For the biggest HP scores, you’ll need even more Energy. It is a good option to have, but when you’re dropping seven [W] Energy to OHKO a target with 230 to 250 HP, that is a massive investment. The baseline [CCC] Energy cost means Hydro Pump can work completely off-Type… but now Vaporeon-GX is doing 40 for three Energy. The GX-attack only requires [W]; “Cure Shower-GX” heals all damage from your [W] Pokémon. The only time you’re likely to have a lot of damage spread out on your Pokémon is against spread decks… and this is a nice option to have there. Otherwise, OHKO strategies don’t leave damage behind to heal and 2HKO strategies mean you used your GX-attack just to negate your opponent’s previous attack. Oh, and if the damage is on non-[W] Types, like say other Eeveelutions, this won’t help them. So… the stats for Vaporeon-GX are pretty good, especially being an Eeveelution and not just a general Stage 1 Pokémon. The effects, collectively, are merely “okay”. You get two so-so healing options and one solid attacker… if you’ve got a lot of [W] Energy or only need a small hit without it. At present, in Expanded there are better attackers for when you can afford to dump a lot of [W] Energy down, like Keldeo-EX. Yes, Vaporeon-GX is a better attacker than Keldeo-EX, and Keldeo-EX offers no healing… but its “Rush In” Ability is still great, the healing is better handled with Trainers, and a deck that can easily afford to fuel Vaporeon-GX for big hits has a decent chance of supplying just a few more Energy for Keldeo-EX to hit as hard. There is also the new Magikarp & Wailord-GX card, as the promo release of it became tournament-legal last Friday. It may be worth three Prizes when KO’d, but it is a 300 HP Basic Pokémon that can do 180 damage for [WWWWW]. That is only 10 less than Vaporeon-GX does for the same Energy! Vaporeon-GX really needed to play nicer with its Eeveelution family. Not all hope is lost, though; perhaps a Glaceon-GX deck backed by Vaporeon-GX would prove worthwhile, especially in Standard where even partial Ability denial (what Glaceon-GX supplies) is in high demand. Vaporeon-GX might have a shot in Standard if the future Energy acceleration revealed from upcoming Japanese sets ends up working better with it than other options. With what it currently has, stuff like Aqua Patch or the Naganadel => Quagsire (Dragon Majesty 26/70) combo just don’t supply enough to quickly beef up its attack and mean you won’t be able to have many Vaporeon-GX in play to utilize its healing. At present, though, all I’ve got is a Glaceon-GX/Vaporeon-GX deck idea (not list) which popped into my head while writing this review. Vaporeon-GX might be a beast in Limited… but you cannot use a promo like this in any Limited Format Event of which I know. Vaporeon-GX is a decent attacker with so-so healing effeects, which would still qualify it for a better score if it played nicer with its fellow Eeveelutions or those roles were better filled by other card. It does have some potential, though, and maybe more with future releases. I mean, we might see some Energy acceleration come along that works better with it than the alternatives.